Inspire Automotive is a manufacturing shop that started in a small garage in 2011. We focus mainly on the design and manufacturing of composite plastics for the automotive industry. We have designed and produced 1000's of plugs, molds and parts for various companies and individuals around the world. Our capabilities include but are not limited to Automotive Design, CAD 3D modeling, CNC machining, Plastic Injection molding, Vacuum forming and tooling design and fabrication. - MIG welder - 14" Bandsaw - 13" Drilling press - 30" Press brake - 30" Metal sheer. CAD is a utility that aids in the process of designing an object in a computerized format. Engineering and Manufacturing relies greatly on the use of CAD modeling software. CAD software allows us to design parts in 3D and to test them before making them a reality. We use 3D modeling software to design and model parts for the automotive industry and to engineer intricate tooling for composite and plastic injection. CNC is a process used in manufacturing that involves the use of computers to control machine tools. With CNC machining, the computer can control exact positioning and velocity. At our shop, we utilize two CNC machines that serve different purposes. One of those machines is a commercial HAAS VMC used to machine hard materials for components in different types of machinery and for fabrication of tooling for plastic injection molding. The other CNC machine we utilize is a 3 axis router table that has a cutting envelope of 5'x10'. It is primarily used to mill large shapes and surfaces out of foam board to create plugs for use in fabricating automotive tooling. The types of composites we work with are fibre-reinforced polymers, carbon-fiber-reinforced polymer and glass-reinforced plastic. These types of composite materials allows us vast options in fabrication for what we mostly use in the automotive industry. We have used composite materials to fabricate thousands of tooling and parts for customers around the world. We also have the capability of manufacturing commercial plastic parts at high volumes with the use of a plastic injection machine. Coupled with the ability to design and engineer tooling for plastic injection is what makes our abilities unique. We utilize new technology to our advantage to help compete in our industry. One of those technologies is the unique ability to 3D scan objects for use in designing products and parts. The types of 3D scanning tools we use varies. We have a system that uses structured light to scan objects and another system that uses laser triangulation. Additive manufacturing is a technology that has become widely available. It is a powerful tool that we use for rapid prototyping of parts. Before we machine final components, we can 3D print them and test them to make sure they work to theory. 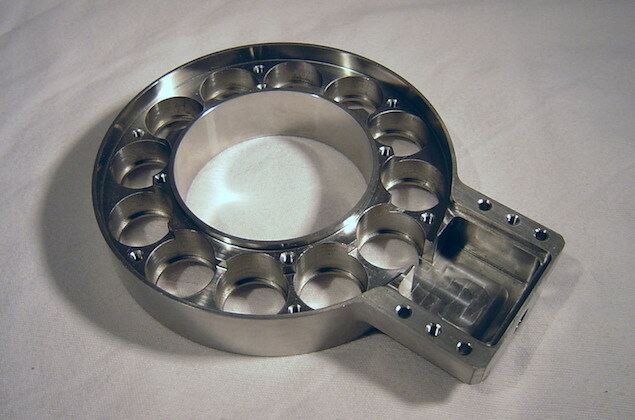 The following galleries are of our work in CNC machining, composite fabrication and various manufacturing processes. Click on the individual images to open the portfolio it pertains to or select from the "projects" tab on the main menu.